Boolean and extrude/revolve solid modeling; mid-surface extraction; project curves onto surfaces; intersect surfaces to create curves; define regions by projecting curves on solid; create curves based on U-V space on surfaces; shell solids with constant thickness; rule, revolve, extrude and loft surfaces; stitch surfaces into solids; create points, lines, arcs, circles and splines;. break, trim, extend, join, fillet, offset and copy geometric entities. DXF and IGES points and curves, stereolithography (SLA) data, ACIS (.sat) Parasolid (.x_t) parts or assemblies. CATIA import model files, and Express files from CATEXP. (CATIA v4.1.x, v4.2, or v5) , VDA Import (up to v2.0), I-deas import (MS8), Pro/E import. (v16 to v20), Solid Edge import, Unigraphics NX import. ( v11 through NX v4). Global and local controls with default sizing. Define element size or spacing with bias. Free surface meshing, quads or triangles only. Mapped meshing with quads or bricks. Direct generation of line, shell and solid elements. Extrude and revolve geometric curves or line elements into shell elements, shell elements can be extruded or revolved to form solid elements. Connected shell elements can be extruded normal to themselves to turn thin-shell models into solid ones. Mesh refinement and smoothing. Subdivision and semi-automatic meshing of solids, Automatic solid meshing with tetrahedral elements. Isotropic, orthotropic and anisotropic. Nonlinear elastic, bi-linear and plastic. Hardening: isotropic or kinematic. Hyperelasticity, creep and composites. Temperature and strain rate dependence. User extensible library included. Geometry or finite element based. Associativity between geometry and mesh. Load case definition and management. Fixed (non-zero) displacements and rotations. Multipoint constraint equations (MPCs). Nodal forces and moments. Distributed loads on line elements. Constant or variable pressure. Velocities and accelerations. Transient dynamic, frequency and random vibration. Temperatures, heat generation or flux. Convection and radiation. Native Windows look and feel. Multiple graphics windows. Multiple model interface. Full, multi-level undo/redo. On-line help with hypertext links. Floating dockable toolbars to access frequently used commands. Toolbar entity editor. Model info tree and entity editor. Data manipulation through the data table. Cut and paste images into Windows applications. Dynamic highlight during selection operations. Box, circle, polygon, front, depth and query picking of geometric and FEA entities. Select entities by associativity (all elements connected to specified nodes, all elements of a specified property). 1-D: rod, tube, bar, beam, spring, gap. Full support of arbitrary and standard cross-sections including all property calculations. 2-D planar solid. 3-D surface or solid. Planar and surface: quads and triangles. 3-D solid: tetra, wedge and brick. All 2- and 3-D elements: linear or parabolic. 2-D planar: plane strain or stress, axisymmetric. 3-D surface: shear panel or membrane. Mass and general stiffness matrices. Contact lines and surfaces, and slide lines. Spot weld elements. Record, edit and playback user-defined macros. Full features, object oriented, OLE/COM-based programming API, can be directly accessed from fully integrated VB compatible BASIC Scripting development environment. Neutral file: fully documented ASCII file format. 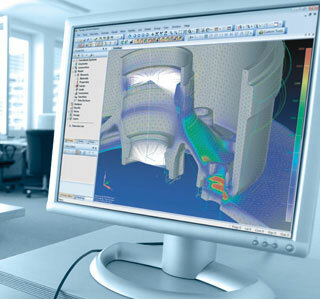 With Femap you can easily subdivide your model for visualization or post-processing purposes,.. Automatically add new entities to active or user-specified group. Group by ID, associativity, material, property, and type. Automatic group creation based on properties, materials, and geometric constraints. Deformations, animations, and vector displays. Single- and multi-load set animations. Filled color contours and criteria displays. Isosurface and cutting planes, with dynamic control. Shear and bending moment diagrams. Error estimates. Results across composite laminates. Extensive result sorting capabilities. X-Y Plots with multiple curves. Text reports: standard and user-customized. Interactive data query with mouse. Freebody displays, including grid point force balance support for grouped entities. Import/export in comma separated tables. Internet publishing with VRML support. Save animations with AVI support. Dual Windows GDI (vector-based) and OpenGL graphics. 3-D dynamic pan, zoom and rotation. Hidden line and wireframe display. Free edge and free face display. Light source shading and transparency. Geometry creation: Boolean and extrude/revolve solid modeling; mid-surface extraction; project curves onto surfaces; intersect surfaces to create curves; define regions by projecting curves on solid; create curves based on U-V space on surfaces; shell solids with constant thickness; rule, revolve, extrude and loft surfaces; stitch surfaces into solids; create points, lines, arcs, circles and splines;. break, trim, extend, join, fillet, offset and copy geometric entities. Import or export: DXF and IGES points and curves, stereolithography (SLA) data, ACIS (.sat) Parasolid (.x_t) parts or assemblies. CATIA import model files, and Express files from CATEXP. (CATIA v4.1.x, v4.2, or v5) , VDA Import (up to v2.0), I-deas import (MS8), Pro/E import. (v16 to v20), Solid Edge import, Unigraphics NX import. ( v11 through NX v4). Meshing: Global and local controls with default sizing. Define element size or spacing with bias. Free surface meshing, quads or triangles only. Mapped meshing with quads or bricks. Direct generation of line, shell and solid elements. Extrude and revolve geometric curves or line elements into shell elements, shell elements can be extruded or revolved to form solid elements. Connected shell elements can be extruded normal to themselves to turn thin-shell models into solid ones. Mesh refinement and smoothing. Subdivision and semi-automatic meshing of solids, Automatic solid meshing with tetrahedral elements. Materials: Isotropic, orthotropic and anisotropic. Nonlinear elastic, bi-linear and plastic. Hardening: isotropic or kinematic. Hyperelasticity, creep and composites. Temperature and strain rate dependence. User extensible library included. Loads and constraints: Geometry or finite element based. Associativity between geometry and mesh. Load case definition and management. Fixed (non-zero) displacements and rotations. Multipoint constraint equations (MPCs). Nodal forces and moments. Distributed loads on line elements. Constant or variable pressure. Velocities and accelerations. Transient dynamic, frequency and random vibration. Temperatures, heat generation or flux. Convection and radiation. User interface: Native Windows look and feel. Multiple graphics windows. Multiple model interface. Full, multi-level undo/redo. On-line help with hypertext links. Floating dockable toolbars to access frequently used commands. Toolbar entity editor. Model info tree and entity editor. Data manipulation through the data table. Cut and paste images into Windows applications. Dynamic highlight during selection operations. Box, circle, polygon, front, depth and query picking of geometric and FEA entities. Select entities by associativity (all elements connected to specified nodes, all elements of a specified property). Element library: 1-D: rod, tube, bar, beam, spring, gap. Full support of arbitrary and standard cross-sections including all property calculations. 2-D planar solid. 3-D surface or solid. Planar and surface: quads and triangles. 3-D solid: tetra, wedge and brick. All 2- and 3-D elements: linear or parabolic. 2-D planar: plane strain or stress, axisymmetric. 3-D surface: shear panel or membrane. Mass and general stiffness matrices. Contact lines and surfaces, and slide lines. Spot weld elements. Customization: Record, edit and playback user-defined macros. Full features, object oriented, OLE/COM-based programming API, can be directly accessed from fully integrated VB compatible BASIC Scripting development environment. Neutral file: fully documented ASCII file format. Groups and Layers: With Femap you can easily subdivide your model for visualization or post-processing purposes,.. Automatically add new entities to active or user-specified group. Group by ID, associativity, material, property, and type. Automatic group creation based on properties, materials, and geometric constraints. Results: Deformations, animations, and vector displays. Single- and multi-load set animations. Filled color contours and criteria displays. Isosurface and cutting planes, with dynamic control. Shear and bending moment diagrams. Error estimates. Results across composite laminates. Extensive result sorting capabilities. X-Y Plots with multiple curves. Text reports: standard and user-customized. Interactive data query with mouse. Freebody displays, including grid point force balance support for grouped entities. Import/export in comma separated tables. Internet publishing with VRML support. Save animations with AVI support. Graphics: Dual Windows GDI (vector-based) and OpenGL graphics. 3-D dynamic pan, zoom and rotation. Hidden line and wireframe display. Free edge and free face display. Light source shading and transparency.